On the walls of the cloister are painted the portraits of various popes who have visited the monastery. 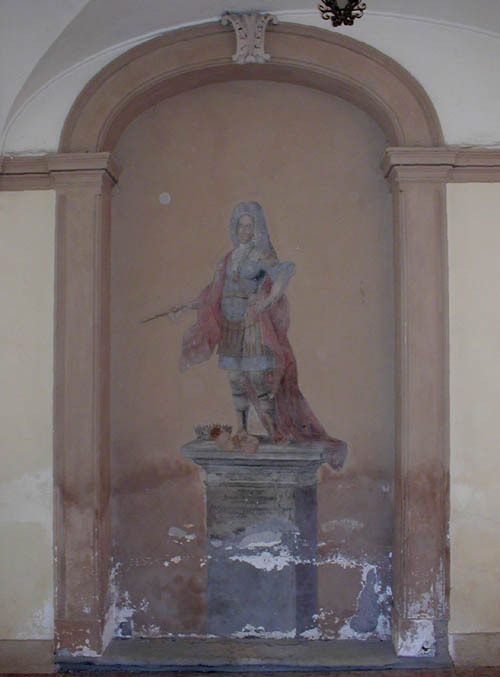 On the right side of the cloister is a fresco of King James III and VIII who visited the monastery in 1733. James is shown standing on top of a plinth. He is dressed as a Roman general with breast armour, a leather-strip kilt, and a red cape. He holds a scepter in one hand and has a crown at his feet. In September 1754 the Cardinal Duke of York (later King Henry IX and I) visited the monastery. The monastery is open daily for guided tours in Italian. 1 Alec Guiness, Blessings in Disguise (London: Hamish Hamilton, 1985), 47-48: "In the entrance to the monastery there is a fresco of 'King James the Third of England' -- the Old Pretender -- riddled with bullet holes. The Abbot shrugged sadly at it. 'One day,' he said, 'we will repair it. The Germans broke in and thinking he really had been the King of England opened fire on the fresco with machine guns." Guiness visited Subiaco in the early 1960's. Image 1 (James III and VIII): © Noel S. McFerran 2004. This page is maintained by Noel S. McFerran (noel.mcferran@rogers.com) and was last updated September 6, 2008. © Noel S. McFerran 2003-2008.